When Do I Need to Re-Pipe My House? We use water every day to bathe, clean our clothes and dishes, cook, and hydrate our bodies. Your pipes deliver water to your home day in and day out without any effort on your part. However, nothing lasts forever, pipes included, so knowing the proper time to re-pipe can save you the hassle of dealing with burst plumbing lines, leaks, and even dangerous levels of lead in your drinking water. What are a few signs that it might be time to re-pipe? 1. Your home was built pre-1980 (ish): Homes built in the early 80’s or before were likely piped using galvanized materials. Galvanized pipes are made with steel and covered with a protective layer of zinc. Over time, the zinc erodes and corrosion can build up inside the walls of the pipes, creating the potential for lead to accumulate. Lead is poisonous and toxic to the heart, bones, intestines, and kidneys. Because it interferes with the development of the nervous system, lead is particularly dangerous to children and can cause permanent learning and behavioral disorders. 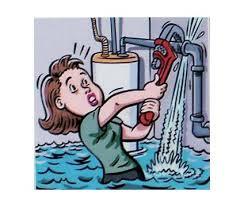 If your pipes are galvanized, it’s time to replace them. 2. Your water tastes funny or looks rusty: If your H2O tastes excessively metallic and you have not made any plumbing changes in the recent past, your pipes may be corroded and leaking high amounts of copper or iron into your drinking water. While low levels of these minerals are not harmful, metallic taste or a rusty color could indicate that high amounts are leeching into your drinking water. If so, its time to replace the pipes. 3. You have low water pressure: Over time, pipes can become clogged and corroded beyond repair, causing water pressure to decrease, sometimes to a drip. If you notice a great reduction in your water pressure and your home was built 40 or more years ago, you could be dealing with pipes that are deteriorated beyond repair and will only get worse. Although you may never think about them, your plumbing pipes play an essential role in the health of your family and the comfort of your home. If you have noticed any changes in the quality or flow of your water, including strange taste, rusty color, low water pressure, or changes in yourself, including unusual physical side effects like headache, abdominal pain, or memory loss, your pipes may have outlived their usefulness and could be poisoning your family. Call Simpson today for an in-depth assessment of your plumbing pipes. Your health and comfort depend on it!